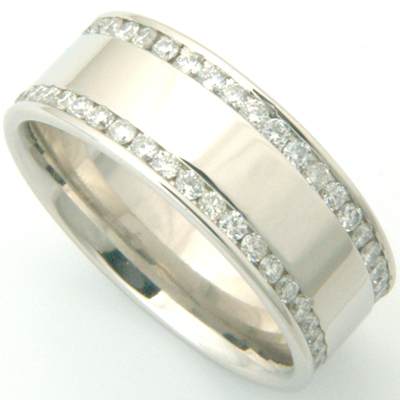 Gents Platinum Double Row Channel Set Diamond Wedding Ring — Form Bespoke Jewellers Ltd.
A stylish double row channel set diamond wedding ring, designed by the customer. This customer started by choosing a platinum 8mm flat court wedding ring from our range at Form Bespoke Jewellers in Leeds. A flat court profile is when the top of the band is clean and flat, but the inside of the ring has a soft curve to it. This ensures a modern look and comfortable fit for the wearer. Around the circumference of the ring, in two parallel rows, are 88 sparkling diamonds! Giving the ring a total carat weight of 1.22 carats. Our expert team channel set each of the 1.5 mm round brilliant diamonds by hand. The ring was hand finished and polished in our Chapel Allerton workshop and the customer was thrilled. 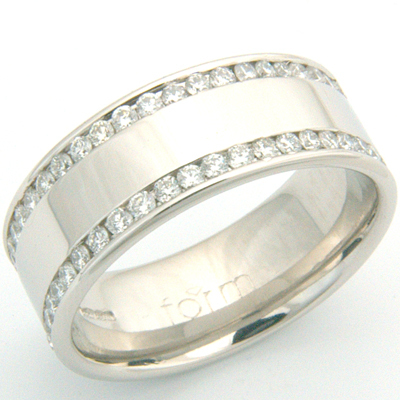 The result is a stunning diamond set gents wedding ring!